Today I learned how to use the Keynote app on the iPad. This app is a great tool for creating professional looking slide shows that can be used by students and teachers. Students can easily make high-quality looking presentations that will help them begin developing their professionalism. This app is not difficult to navigate through and the features are easy to figure out but still add a high quality punch to your product! Students can easily add picture, charts, graphs, and text to slides. This app is great for students in any kind of class. It includes charts and graphs which could be used for math or science classes. Also, their are easy ways to create links that help one navigate throughout the slide show and add pictures which are great for any content area. Teachers should also look into using this app as a way to create high-quality visual aids to their lessons and making presentations that the can show to their colleagues. What I found most interesting about this app is that it is easy to make links within slides to go back to other slides. As in, I could link slide 3 with slide 8 easily if they had similar content and create a link that allows me to go back and forth to each. This is certainly a very good app to incorporate into the classroom for both students and teachers. 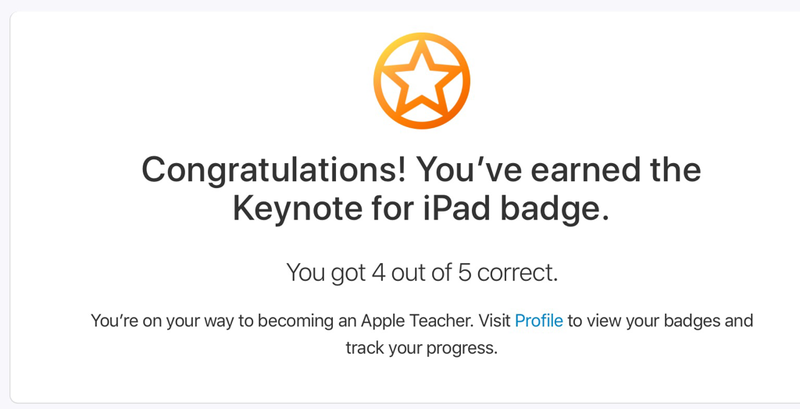 I learned how to use this app and took the test to earn my Apple Teacher Keynote Badge. Teachers, you can download the app and get the badge too and learn how to make your own Keynote project. So that you are able to have an example of what using Keynote is like, I have included a slideshow to the right of the project I worked on through Apple Teacher.